March is a good month for me already. I just received something exciting in the mail yesterday (which I'll show you tomorrow), and there are more exciting things to come. But something else that I've been hoping for has happened, and it got started yesterday. I had been trying to work up enough courage to ask if I could create a pattern for one of Feeling Stitchy's monthly Stitchalongs. For nearly a year I've been thinking of how wonderful it would be to participate as a designer...and then dear Floresita emailed to ask me! Imagine my excitement when I not only got to design something, but I got to do it for Feeling Stitchy's 5th birthday! Yay! So, available only on the Feeling Stitchy blog you can download a pattern set with this piñata, some balloons, gifts, and a personalized cake. Go get the patterns, wish them a happy birthday, and then get to stitching! Adorable, Mollie! All of the patterns are! The graceful string for the balloons, the perfectly pointed tissue peeking out of the gift bag, the spot-on cake that is Food Network worthy, and the other gifts that spur all kinds of ideas of what wonderful things are hiding inside! And the adorable pinata that would be difficult to beat with a stick if it were filled with candy at a party! It's just too cute! Thanks again for the wonderful creations! every time I come on this blog I see something even more adorable than the last! hi i just found your blog and i am so glad i did! and this post is amazing! i am definitely a new follower, keep up the great work and looking forward to reading your next post! i wonder what you recieved in the mail! would appreciate it if you could check out my blog! How and where do you find all your ideas? that is sooo cute! love the patterns, thanks for sharing! I am loving this precious pattern! So simple and sweet. 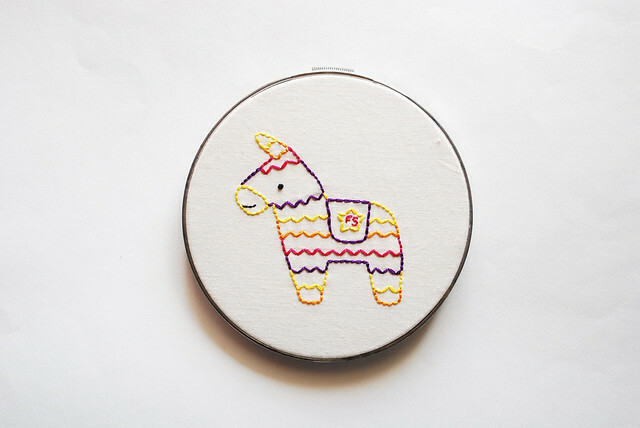 Ugh, I want to stitch like this! You can stitch like this! It's not difficult! I FINISHED IT ALREADY, AND ALSO SHARED WITH MY FRIENDS IN BLOG. THANKS FOR YOUR PATTERNS. I put this cute little guy on my notebook - it cheers me up in a somewhat dull class!